There is a certain pain being a scotch enthusiast in America. That being that there is a massive body of water in between the distilleries in Scotland and our taste buds being parked in North America. Yet a few retailers have seen fit to ship products over to us and for this, I am thankful! So my most recent order from Master of Malt held a few goodies that I wanted to try and one bottle of Edradour that a retailer in California had but by law could not ship to the Commonwealth of Virginia. WTF! So I’m not going to get into a rant about the idiotic laws between the States in America and their agreements to sale or not to each other, but in times when we need all of the money to change hands in this country to support jobs, I’m just at a loss. And so is a shop in California. So two of the small 3cl bottles I ordered contained something very unusual. An actual Dalmore single cask tasting. If you enjoy the Dalmore, as I do, you are used to the usual complex offering that Richard Paterson assembles with single malts in various casks to achieve a unique offering. These offerings are very nice and win awards, but they do not market a single cask to my knowledge. So seeing this 14 year aged product distilled in 1996 was a must try, and it has left me begging for, a full bottle! I drank the first one about a week ago and was so impressed with its freshness and difference compared to other Dalmore offerings. You immediately notice that this does not have a sherry nose or color. The nose was light and if I was unaware of what I was about to drink I would guess a Speyside offering. The ABV is 55.5% which is quite a bit higher alcohol content than what Dalmore’s typical offerings are at. This was not lost on me when I took the first sip! It’s like a rose garden exploding in your mouth! But like Dalmore offerings quietly leaves a great mouthfeel and actually left me begging for more. I do taste a lot more than I write about, pesky day job and all keeps me down, but I had to make note of this one! 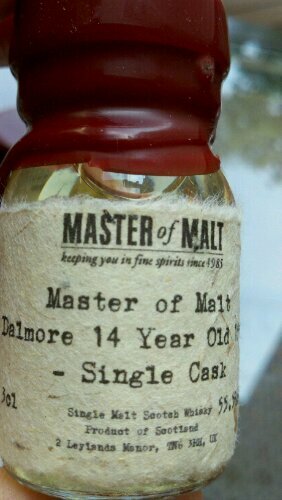 I would encourage you to try out the Master of Malt offerings, it’s the only way to get unique offerings on this side of the Pond (known officially as the Atlantic Ocean) and I loved tasting this “naked” Dalmore offering.